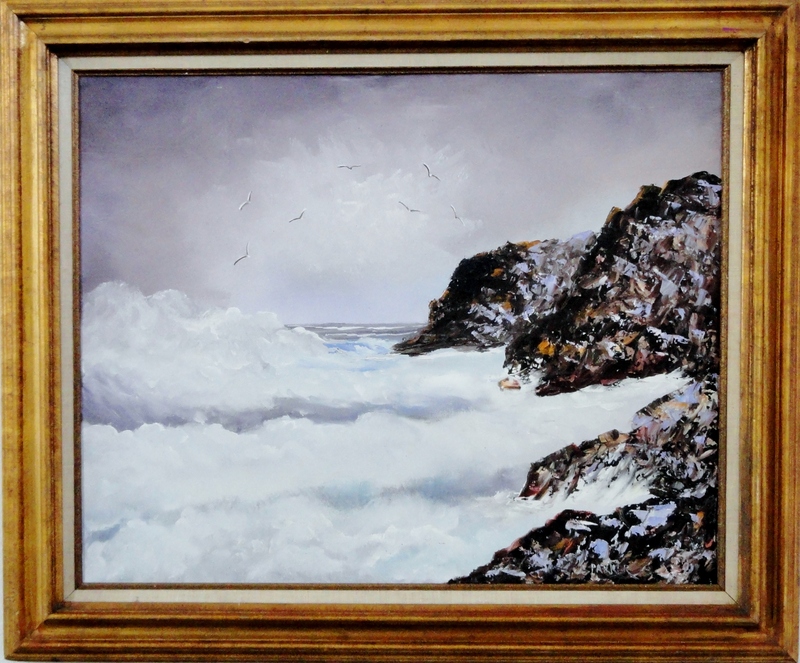 This is a 24″ x 30″ oil on canvas mid-century modern seascape painting, signed Parker. 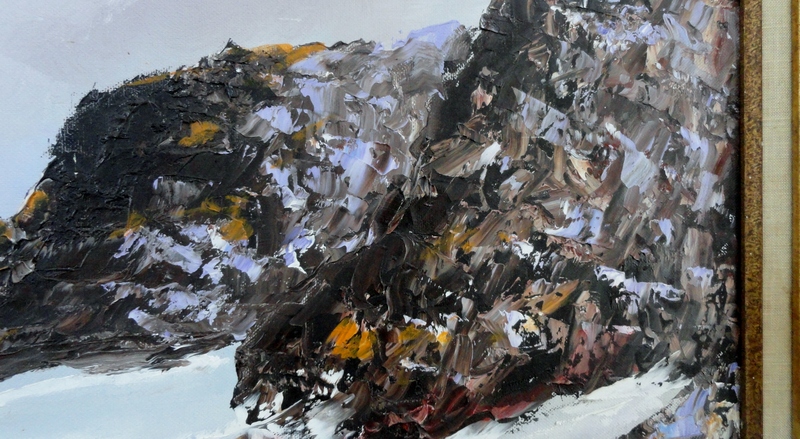 I think this painting was done in the 60’s, considering the way the palette knife was used to create the jagged texture of the rocky shoreline, in contrast to the more subdued, more minimal treatment of the ocean, seabirds, sky, and rolling and churning waves. I had owned this painting for quite a few months when I found another feature in this painting that just made me go WOW!. I usually collect impressionism, realism, illustration, landscapes, California en plein art, seascapes, Asian art, and original costume design paintings, but recently I’ve begun to collect abstract paintings, or works that include abstract qualities, like the rocky cliffs in this painting. And this one is a great example why. 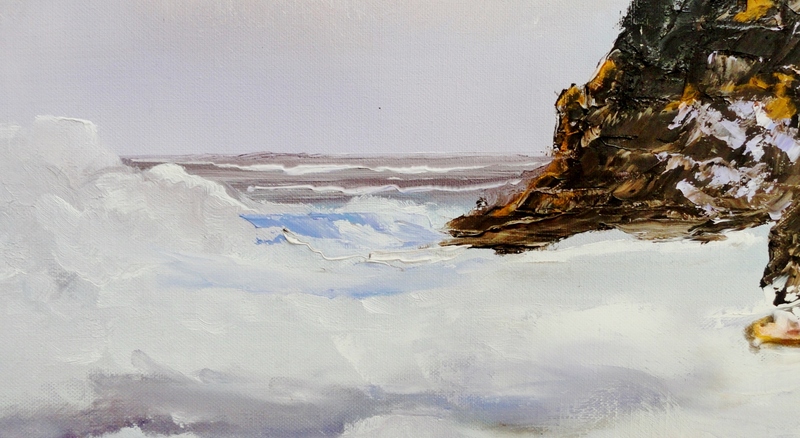 At first, for me, the painting grabbed my attention by the way the artist captured a rocky beach scene, with a more jagged and thick texture for the rocks, and a smoother texture for the ocean waves. I thought the seagulls flying overhead were also a very nice touch. But what I hadn’t noticed, and hadn’t seen in all the while I’ve this owned this painting is the appearance of two people standing together, out on the furthest rocky point I’ve added a couple of new photos to try to show this couple. Seeing this feature for the first time on this painting just made me have an “Aha!” moment. I respect the creativity, and artistic talent of the artist even more now than I did before. I revisit paintings from time to time, and I was once again surprised by more hidden imagery in the painting. There’s a profile of a seagulls head in the lower rock, a moray eel with it mouth open, that includes the head of the seagull, in the right middle cliffside of the painting, and perhaps a dolphins head in the cliff furthest away. You can even see at least two faces in the crashing waves, and an eel head attacking what looks like a small golden domed flying saucer in the water. All of this adds a surreal whimsical quality to this midcentury painting. Just thought I would share that with whomever is looking at this painting. Make an offer / Ask a question.